Folks in Plymouth, Duxbury, Kingston, and the surrounding area come to physical therapy here at Redpoint for a number of reasons. Some are athletes looking to return to competition, some are older and are looking to keep the aging process at bay, some are dealing with neurological issues and others are recovering from surgical procedures and get referred to us by their surgeon. We have an affinity for all of our patients… because we can understand. We’ve “been there, done that” personally with most of those situations. Breast cancer is a disease that’s touched most people in some way. Mothers, grandmothers, aunts, sisters, daughters and nieces all have the potential to get the diagnosis. Many people don’t realize that fathers and grandfathers and brothers and husbands can get it too. It also occurs in our pets. I know a very special cat that lost her fight to breast cancer recently. In 1985, the American Cancer Society and a division of pharma giant Astra Zeneca came together to increase awareness for mammography procedures that can help with early detection efforts. They designated October as “National Breast Cancer Awareness Month”. In 1993, Evelyn Lauder of the Estee Lauder cosmetic company added some design flair with the iconic pink ribbon symbol after the Susan G. Komen Foundation had handed out pink ribbons to survivors at an event in 1991. The rest, as they say, is history. The month is now flooded with walks and runs, pink illumination on landmark buildings, comic strips printed in pink, pink hued Facebook pictures and, of course, the pink gear in NFL games and on high school sports fields across the country that the New England Patriots wore in their big win against the Bengals last night. Our personal favorite October happening is Providence’s Waterfire sponsored by The Gloria Gemma Flames of Hope organization. You can check out the event details at http://waterfire.org/blog/october-11-2014-full-lighting/ but, if you’ve never been to a Waterfire, this is the one to check out. The RI State House at the head of the event illuminates the “Celebration Village” and concert venue in pink while music plays along the river and cauldrons burn bright atop the water. There are other events closer to home and in Boston… but the message is clear: We can catch breast cancer early and we can beat it. In 2014, an estimated 232,030 cases of invasive breast cancer will be diagnosed in the U.S. alone. That represents almost 25% of all cancer diagnosis in the country. The survival rate is very good and, though the explosion of pink is controversial, it has helped bring up those survival rates. More info can be found at the Susan G. Komen web page listed below. Finally, at Redpoint PT, we've decided to our part by going pink. We've done up some very special t-shirts and we're offering them for $10 a piece. 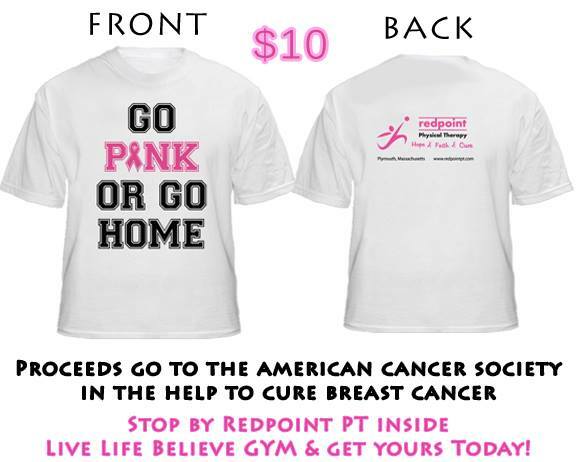 The proceeds benefit the American Cancer Society. Every little bit helps. It may help your mom, your dad, your cat... or you. After a couple of pretty serious blogs (Multiple Sclerosis and Childhood Cancer Awareness Month), we figured that we’d have a little fun and searched “physical therapy cat”. If you haven’t seen our new “Fee for Service” brochures – the back cover is adorned with a pyramid of cats doing yoga. We’ve promised Joe that we’ll include dogs in the next design. We like our four legged family around here too. When we googled the term, we were expecting to see some memes. We expected that “Physical Therapy Kitty” would be a relative of “Basement Kitty”, “Ceiling Kitty”, “Nazi Grammar Kitty”, and “Piano Kitty”. We did find him… but we found plenty of pictures of cats and dogs receiving physical therapy. We want to give a huge shout out to our fellow therapists who concentrate on the nation’s pet population. If you’ve ever done any therapy in a pool… or seen it done, you’d be amazed at the preparation it takes to get ready, particularly for profoundly affected patients. 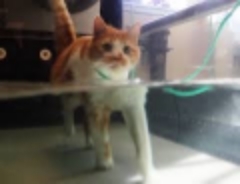 We can’t IMAGINE getting a cat ready to go into the pool. It takes dozens of treats just to coax Mr. Pigg out of the sunlight so that we can give him some medication at home… and he’s relatively healthy (if not glorious). We’d also like to give a shout out to special needs rescues like “Blind Cat Rescue” from North Carolina and “Best Friends”, from Nevada, where they have special needs houses on a huge campus like facility. It is a special person who takes the calling to care for animals to the extreme. If your pet can benefit from physical therapy, know that there are those out there who do it (we’ve thought about adding a specialty at Redpoint). While we’re on the subject, we’d also like to send a shout out to our local rescues, Papa’s Pets, Helping Hands for the Plymouth Animal Shelter and Friends of the Plymouth Pound. We’ve provided links below for these awesome groups.